Lightning Bolt Crack is a zig-zagging, left-leaning, overhung, rattly fingers splitter on perfect shield of golden, diamond-hard rock. The crux is right off the ledge until a hand jam in a pod is acquired 30 feet up. This is solid, sustained, steep 5.11 crack climbing. From the handjam, steep fingers lead to good jugs (11-). After a mantel onto a shelf, more steep climbing leads to a stance (10/10+). Begin by climbing Escape Artist or Comic Relief to the Lightning Bolt Crack ledge. In the left corner is a dirty 9+ handcrack. On the face just to the right is the Lightning Bolt Crack. You can't miss it. 1-2x 0.4, 2x 0.5 and 2x 0.75 C4, a couple large nuts, and a hand-sized piece or two. Bring more 0.5 C4s if you don't like leaning ringlock splitters or are strong enough to sew it up. 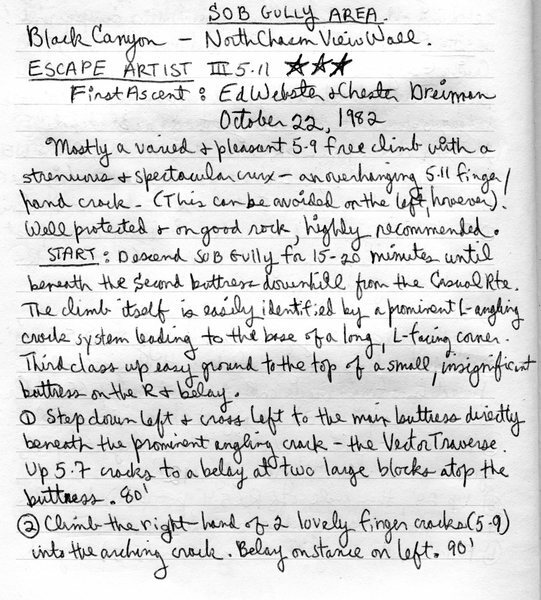 Over the years, most parties have opted for the easier "broken corner" to the left of what is now known as the Lightning Bolt Crack, dropping the overall rating of Escape Artist down to 5.9+/5.10a. However, Ed and Chester originally climbed this pitch as part of Escape Artist. They returned the next fall to climb the FA of Comic Relief in September, 1983. 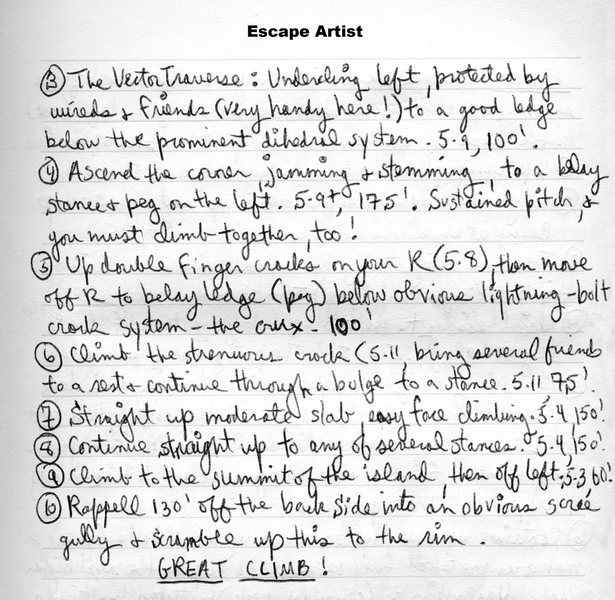 Ed's description for Escape Artist (page 1). Ed's description for Escape Artist (page 2).